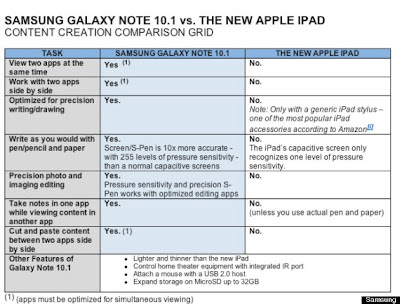 Today we are going to show you the most common hardware and software features comparison between the most promising and fully loaded features Smartphone's Samsung's Galaxy Note 10.1 and Apple's New iPad 3 so that you can decide yourself which one is best for your personal use and for business purpose use. Apple has recently launched its new iPad version called "The New iPad" but most people is now aware of its fully hardware and software compatibility. On other side Samsung has also launched its new Galaxy series smartphone called "Galaxy Note 10.1" which is also quite good in terms of hardware and software compatibility. Apple's latest New iPad 3 is now become the top competitor of Samsung's Galaxy series smartphones and tablets but Samsung feels that they don't need to release something new to compete with it, according to their latest assessment of their closest rival. The Android-based Galaxy Note 10.1 is Samsung's latest tablet model, taking its design from the Galaxy Note 'phablet', which is just about the right size to be a challenge to fit into your pocket. 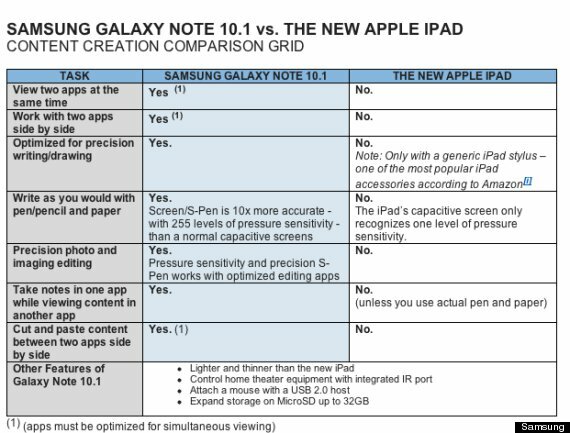 You can check yourself the following Samsung's Galaxy Note and Apple's New iPad 3 Hardware and Software Comparison image and decide yourself which one is best in terms of features.